“Musical Europe: The Golden Age of Consort Viol Music (1500-1700)” was the dissertation-like but poignant title of the concert presented by Jordi Savall and his illustrious early music band Hespèrion XXI at Jordan Hall last Friday the 2nd for Boston Early Music Festival. It was appropriately dissertation-like, since scholarship is a large part of Savall and friends’ artistry and their quest to reanimate the elusive musical practice of centuries past. And also appropriately poignant, because no matter the skill and sensitivity with which the musicians held the audience spellbound, there also remained over the evening a faint air of wistfulness—acknowledgement, perhaps, of the long-ago passing of an art once alive and dynamic, now brought to life with loving care but only appreciated through a curtain of reverence. “Golden Age” comes with the implicit corollary of decline, but Savall and company set out to prove that even though the viol consort may be an anachronism, the feeling contained in the works to which it lends its unique voice has an enduringly affecting quality. The pre-concert set-up, beneath the rococo décor framing Jordan Hall’s stage, humbly consisted of a half-moon of stands and chairs, some with resting viols, with a raised podium at the apex bearing a large and cheerfully green drum—one of several instruments to be played (often simultaneously) by percussionist David Mayoral. The serious but unassuming aura that the black-clad musicians brought to their entrance, the requisite unhurried tuning conference, the reserved introduction of the first selection by vilhuela and plucked bass instruments, the poised transitions between dances, all contributed to the mix of ceremony and intimacy that characterized the evening. The program, organized into six geographically-oriented sets, consisted mostly of stylized dance-based compositions: pavans, galliards, allemandes, passamezzos, sarabandes, tambourines, folias, and more, as well a few multi-part French ballets. The characteristic details of each dance were perhaps lost on the ear not steeped in historical analysis; my own ear, at least, experienced the dance sequences as a minutely shifting tapestry of rhythm, phrasing, and instrumental exchange. Hespèrion XXI has attuned its collective musical brain to a frequency different from that of the modern musical world—a hypnotic progression built of intricately layered and organically evolving repetitions. 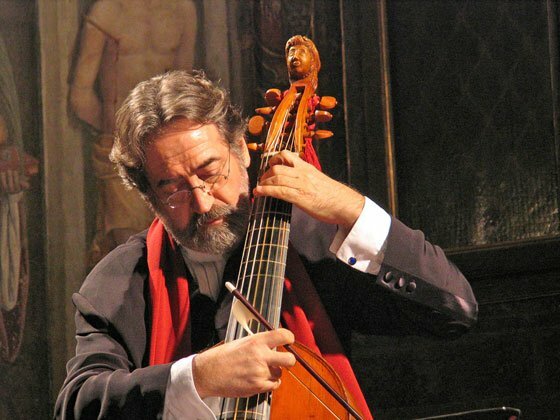 A mutual internal calibration born of long experience is the only thing that can explain the cohesion with which the players (the viol consort comprising five and featuring Savall of treble); Mayoral; and Xavier Díaz-Latorre on the strummed string instruments vilhuela and theorbo) moved through their steps and turns. The first set of Italian dances featured handfuls of rapid notes executed perfectly by Savall and tenor player Sergi Casademunt in tandem, all the more impressive as their bowing technique did not include slurring (playing multiple notes under one bow), but only the rapid wrist movements that can make the light viol bow dart back and forth in a blur. The offbeat bell that introduced the Italian set’s finale, improvisations on folias, was another finely executed sleight-of-rhythm. Savall’s signature improvisations shone here and throughout the evening with virtuosity, sensitivity, and excitement. Seeing him gently folded around the diminutive instrument on his lap, speeding through the notes with compact, focused movements, might at first bring to mind a cellist playing a violin as a party trick—but one did not need to watch Savall or any of the viol players for long to comprehend their thorough understanding of the physical language of the instruments. This understated language—instruments held on laps or rested on calves, bows held underhand with the arm close to the body—contributed to the attitude of thoughtful meditation that pervaded the performance. The ceremonial flavor was tempered by the musicians’ sense of friendly communication; Díaz-Latorre in particular was a pleasure to watch as his smiles and attention roamed the circle. A Dowland Lachrimae signaled that the Italian dancing was temporarily over and introduced an Elizabethan set. Dissonances and sweet resolutions were skillfully shaped, keeping the often repetitive pieces from monotony. Two evocatively named numbers brought gentle changes of emotional winds: The Fruit of Love was bittersweet, combining playful drum and tambourine with melancholy modal turns, while As it fell on a holie Eve was swinging and joyous, in the celebratory Christmas spirit. A set of Spanish dances and variations began with not the expected sun-splashed rowdiness but rather with ominous octaves, which bloomed into the proud, stately chords of Diego Ortiz’s La Spagna. The closing improvisations on Canarios finally delivered the awaited high spirits, with the bass section laying down a groove over which Savall and Díaz-Latorre exchanged witticisms. Savall drew giggles from the audience with whimsical flutters in the highest reaches of his instrument and mischievous left-hand pizzicatos, shredding with obvious delight over the range of his instrument. The post-intermission French set began energetically with a Pavane and Gaillarde featuring a snappy dotted theme that trailed off pensively. The extended Ballet: Les Bergers featured a pastoral theme rendered with unique richness by the viola-like lower register of Savall’s viol, doubled by bass. Sarabandes and a short, hoe-down-like Tambourin closed the set. The German grouping, featuring music by Samuel Scheidt, was clever and lively, and included the playfully martial up-and-back of the closing Galliard Battaglia, an entry in the cocky, battle-mimicking battaglia genre. The players’ fierce bow strokes even looked like marching bayonets, and Mayoral’s green drum was in its element. The last part ranged over the European Baroque landscape, with whimsical inspirations from new world savages (the French Ballet: Les Ameriquains, which with its sunny disposition seemed at times to anticipate barn dances of the future) to Shakespeare’s A Midsummer Night’s Dream (Purcell’s “Dance of the Fairies” from The Fairy Queen). The closing Spanish El Jarabe loco was the merriest jam session of the evening, bringing the audience to its feet with virtuosity, energy, and joy. The intrepid performers returned for two encores: a “Scottish dance” from Hamburg, replete with bagpipe-like drone in the violone, and a bourée written for the birth of the Dauphin of France , Louis XIII. Zoe Kemmerling, a recent graduate of the Boston Conservatory, is a freelance violist, baroque violinist, writer, and string instructor.